I laughed, because I spend much of my time wondering how a huge/complex organization can compete with smaller organizations in this arena. The benefit of having 125,000+ donors is also a curse when it comes to figuring out how to personally and creatively engage them and provide meaningful stewardship. Rather than thinking of the shoestring budget and smaller donor population as a detriment, take a positive view of this situation. It’s much more realistic to provide donor-specific stewardship opportunities to a few hundred individuals than to hundreds of thousands. Personalized attention for donors at all levels suddenly becomes an actionable to-do item. In the most basic terms, consider the initial acknowledgment. Ideally, it’s personal. It’s timely. It’s sincere. And it utilizes the power of storytelling to show the donor just how much their gift matters. Even with unlimited resources, it’s challenging to do that 100,000 times! At a small nonprofit, for very little money, the staff can hand-sign and embellish every form letter. Better yet, if the circumstances permit, they can hand-write thank you notes to all. They can pick up the phone and make a call to say ‘thank you’ when a gift arrives. In this digital age, when others are looking to streamline everything (and unfortunately many are sending e-mails instead of letters) you can go the other direction and truly stand out. All for the low-low-price of 44 cents plus a few minutes of time. Before anyone jumps all over me and says time is the biggest issue, remember you’re not the one writing all the notes. Anyone can write the note. You, your staff, your volunteers. I don’t care who writes it, a heartfelt and sincere note of appreciation handwritten by somebody close to your organization will leave a lasting impression. It also costs very little to bring your supporters to where the action happens. Invite them to see the good work being done. One on one or in a group setting, this establishes a deeper relationship and lets them see first-hand how their gift makes a difference. They actually meet the people responsible for doing the work and see those receiving the benefits. Now you’re no longer just a faceless organization, you’re a living breathing person using their resources to make the world a better place. And it doesn’t cost much to provide that type of stewardship! Nonprofits excel at finding new and creative ways to do more with less. Being small has it’s advantages! 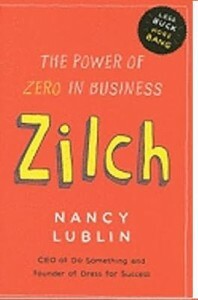 For more on working with a shoestring budget, I highly recommend Nancy Lublin’s book “ZILCH” which is a great look at running a business or nonprofit with limited resources. I’ve been planning to blog about this book since July 2010 (it’s a long story, and when I get around to writing that post I’ll tell you about it) but haven’t done so yet. So my mini-review is this: spend some of your limited resources to buy this book. The ROI will be significant! I occasionally share fundraising videos that catch my attention, and this one has been haunting me for weeks. Normally, I’m not a big fan of the ‘depression video’ which makes me feel so horrible by the time it’s over that I feel compelled to give. I prefer upbeat, hope-inspiring videos that make me think and feel good. But I guess as long as I’m compelled to give, the video is doing its job, right? I confess I haven’t given (yet), but I’ve been thinking about this video since the first time I saw it, and the subsequent 2-3 times I’ve caught it on TV have been enough to drive me to the website and consider adding HSUS to my charitable contributions list. We’ll see if I make the leap. In June, GettingGiving featured a cartoon by Mark Litzker that told a sad but true story about fundraising, realistic expectations and social media. Mark is both a fundraiser and talented cartoonist and he generously shared several examples of his work for use in the future. After opening my electric bill this month, I decided the future is now. If you haven’t heard, much of the Midwest is in the middle of a heat wave, and the continuous 95-degree days are making the air conditioner work overtime. 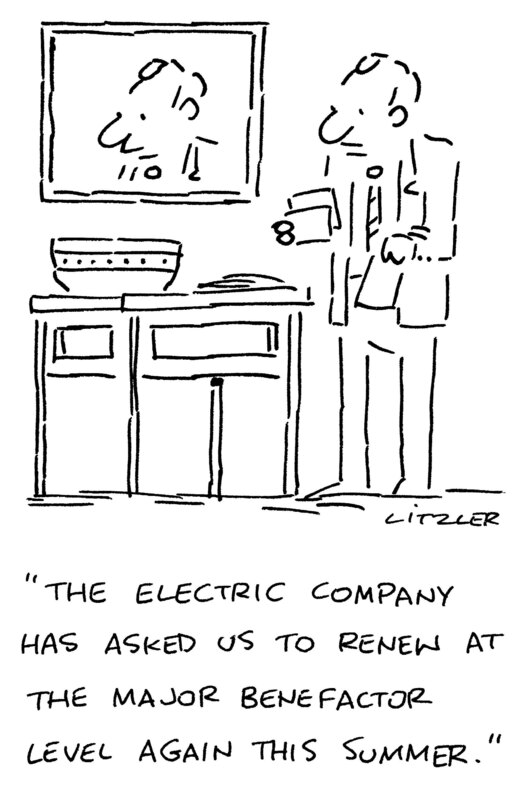 Mark’s cartoon seems all too real to me!